How do you bring a cramped 19th century apartment into the present? For architects Florent Chagny and Marion Bernard of Flca, it's all about choosing the right materials. 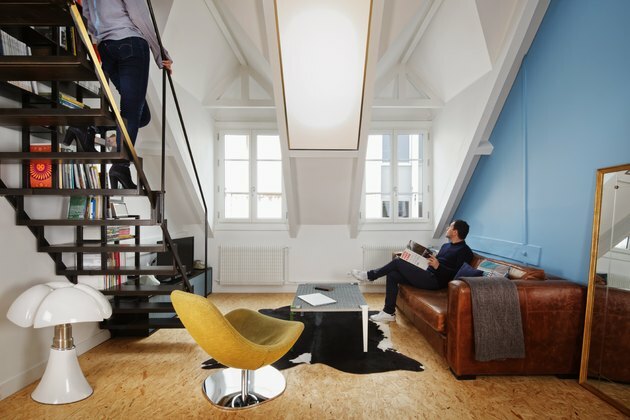 And for this 538-square-foot duplex in Paris, they selected an unconventional mix to give the apartment a new identity that was more in line with their client's contemporary style. 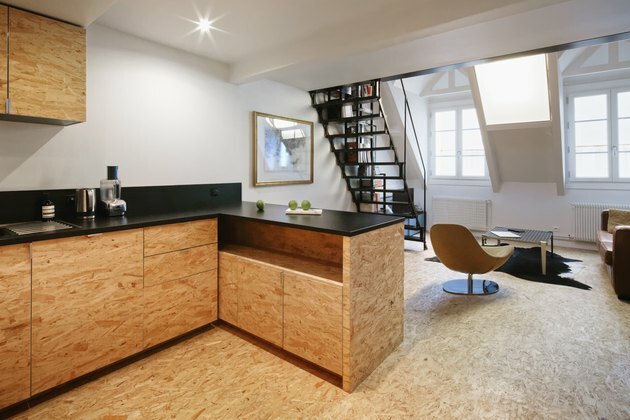 The architects chose oriented strand board (OSB) as the primary material, using it to create everything from cabinets to flooring to furniture. 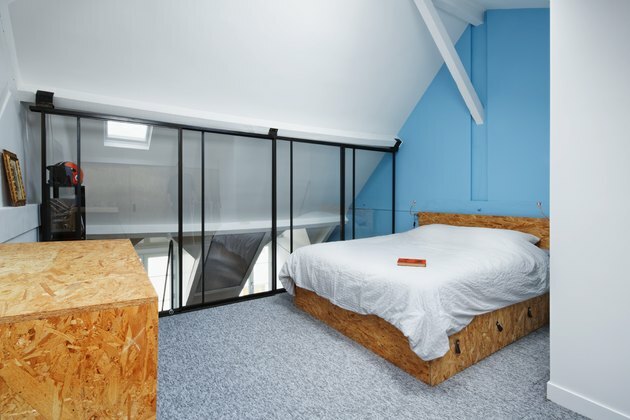 OSB is generally used for structural purposes and is hidden away within walls or beneath floors, but Chagny and Bernard wanted to highlight the inexpensive boards throughout the space. To make the most of the limited square footage, the team removed several partitions to create an open kitchen that flows into the living area and entryway. A spiral staircase from the '90s was replaced with custom steel stairs, and they also added a glass partition in the mezzanine level's bedroom, allowing light to pass between the two floors. The finished project is an of-the-moment space that lets its humble industrial materials shine. The entry is kept uncluttered with a custom storage unit and minimalist coat rack. 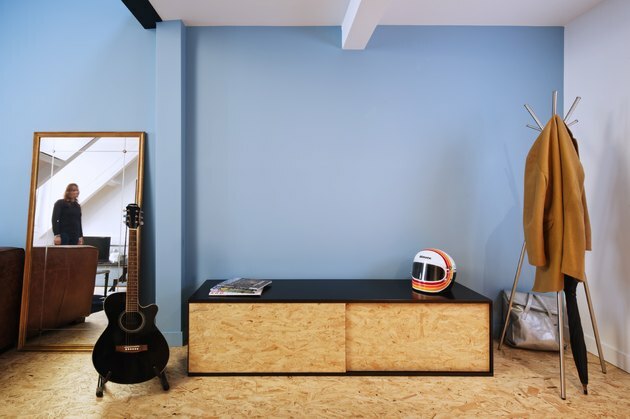 Sky blue paint was used to create a calming accent wall that extends through both floors. The gabled windows in the living room allude the home's history. The apartment is located at the top of a small 1830s residential building set between the Panthéon and the Jardin des Plantes. 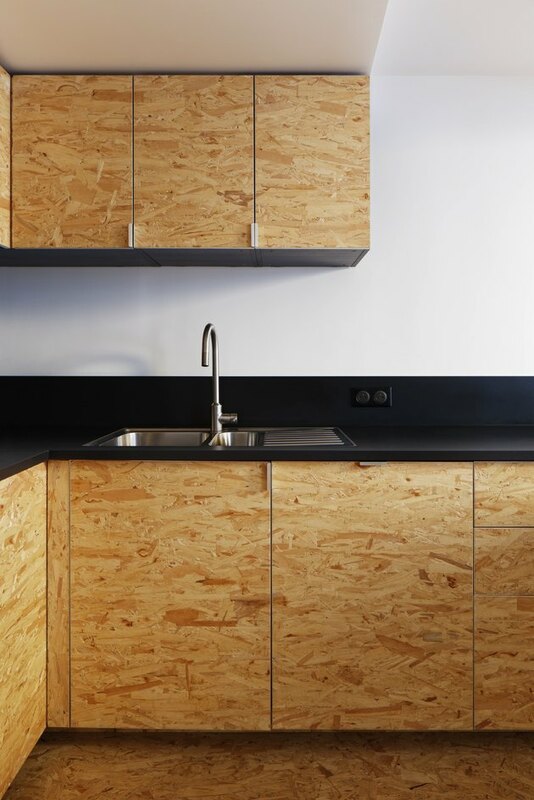 Black countertops contrast with the OSB cabinetry and floors in the kitchen. The architects removed partitions to create an open floor plan. 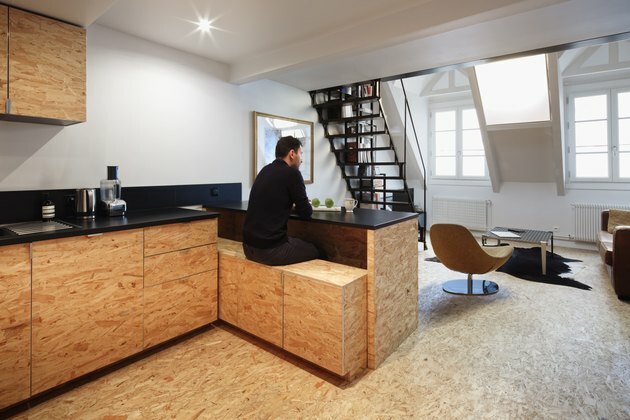 The OSB floors allow the kitchen to seamlessly blend into the living space. With limited space for a dining area, the architects came up with a clever solution. The kitchen's peninsula slides forward to become a dining table and the cabinets below do double-duty as bench seating. 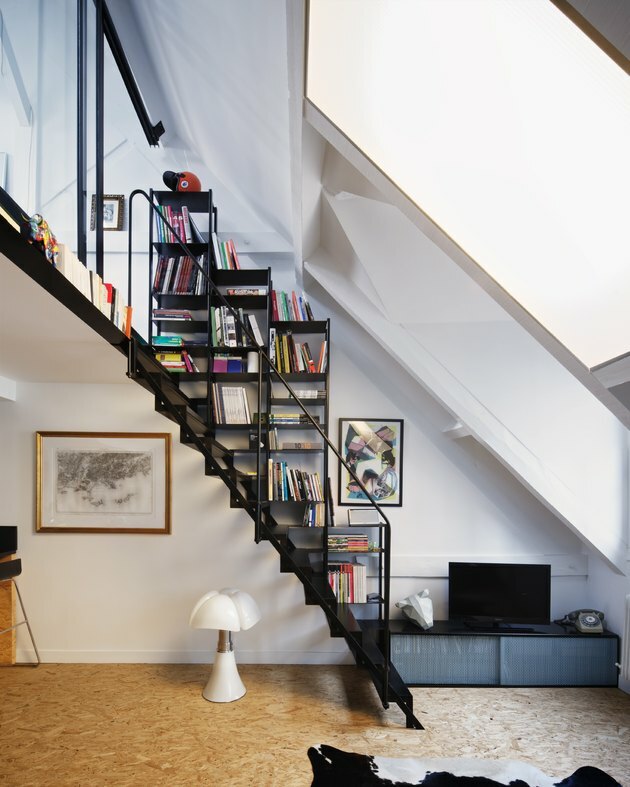 The custom steel staircase incorporates a bookshelf to make the most of the wall space. A ledge running along the mezzanine adds additional room to display books and art. The bedroom, which is furnished with custom OSB furniture, overlooks (and gets extra light from) the living room thanks to a new glass and steel partition. 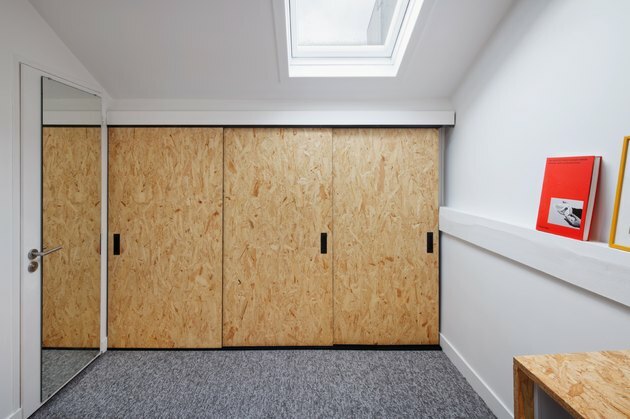 Sliding OSB doors conceal storage space on the upper level. Skylights help keep the area from feeling dark and cramped.